Reedy Fork Creek along the Laurel Bluff Trail. I defied a rainy weather forecast yesterday and notched another hike on the Greensboro Watershed — this time in a seven-mile loop taking in the Laurel Bluff and Reedy Fork trails east of Lake Brandt. At first glance this one pales in comparison to the meandering river of last week and the thundering waterfalls of the week before that. I headed over to Greensboro because I didn’t see the logic in investing much time, travail and gasoline in a long haul to the highlands when the weather gurus were predicting scattered showers from overcast, Confederate-gray skies across the Carolinas. I wasn’t expecting much, which made the bamboo all the more surprising. Turns out the Eastern Seaboard has several species of bamboo; I have a sneaking suspicion the ones I saw yesterday (above right) were imported exotics that drive ecologists crazy, but in any case it was a jolt to happen upon this grove of them towering over the Laurel Bluff Trail not far from the western trailhead. 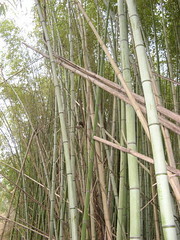 I love bamboo — either it’s feeding China’s pandas or it’s enabling dubious rescue schemes on Gilligan’s Island. Inherently cool. The rest of the hike was more what you’d expect from a suburban stroll around the shore of a lake in the last weekend of March. Not a lot of elevation gain, but far from totally flat. A few buds starting to sprout; occasional waterfowl sightings; and another of my favorite nature things: tree stumps chewed to a pencil point by enterprising beavers. On to the trails: I started out on the western end of the Laurel Bluff Trail, a segment of the Mountains to Sea Trail starting just south of the Lake Brandt dam. 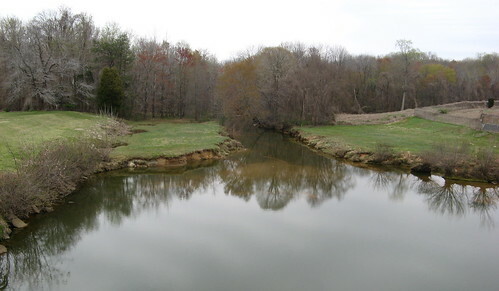 Laurel Bluff starts out along the Reedy Fork Creek, which empties into Lake Townsend. The trail ends at Church Street after just over three miles; your options are to come back the way you came, or hang a left, cross the bridge over Lake Townsend and take another left on the Reedy Fork Trail, a 3.5-mile track that returns you to Lake Brandt Road, where it’s a left turn and a short walk over a bridge back to the Laurel Bluff trailhead. 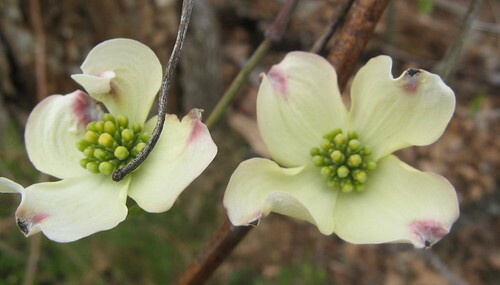 Buds provide tiny sprinkles of color. 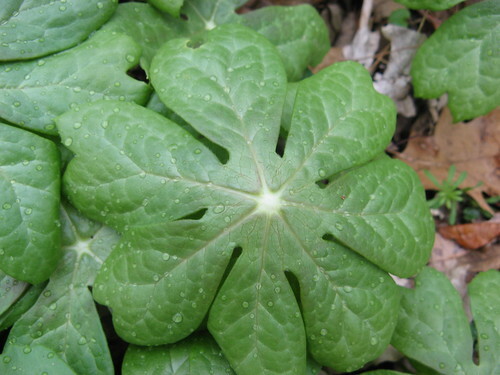 These broad-leaved plants formed a carpet on many sections of the forest floor. The hike wasn’t very eventful till I ended up about a quarter-mile off course. The Reedy Fork Trail comes to a road, where you’re supposed to turn left, cross a causeway, and take another left at a small brown sign. There’s an unmarked trail on the far side of the road, which is where I turned and hiked in happy oblivion till I noticed a muddy patch on this supposed mountain-bike trail that had no mountain-bike tracks. The half-mile detour offered a timely reminder that a GPS unit is no substitute for a map — it’s a companion. My unit told me where I’d gone, but could not say where I’d gone wrong. Only a map could show that. 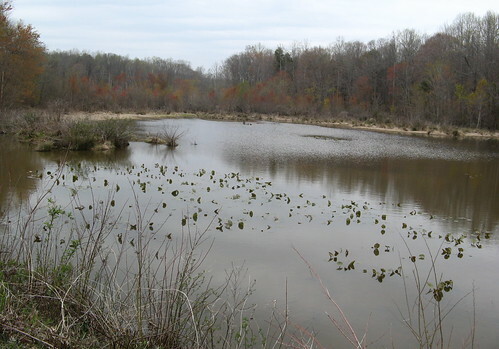 This pond is along Plainfield Road along the way to the left turn where Reedy Fork Trail continues. 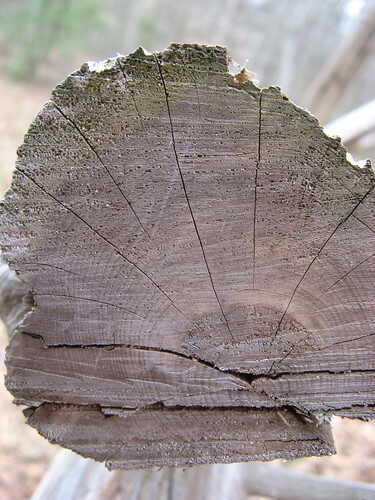 Tree rings in closeup, thanks to my camera’s macro mode. Eventually the trail ends at Lake Brandt road again, where you turn left and head back to the parking area. Here’s the view along the way, looking east. So that’s enough for this round. One thing to bear in mind about this loop: Greensboro’s water district often lowers the floodgates at the Lake Brandt Dam when a huge storm threatens to flood the lake — that can flood some of these trails, especially along the Reedy Fork Trail. If you find flooded trail, just go back the way you came. There’s no telling how deep it might be. bamboo is not just for pandas! i love it as well. In fourth grade, my friend john and his mother fed me bamboo. I remember it tasting good. Bamboo also makes an extremely comfy t-shirt. nature pictures are always a treat for eyes, we feel so calm and focus when we see such beautiful pics, thanks for sharing. I made the same wrong turn you did on the Reedy Fork Trail just about a month ago! When I returned to the road, a cyclist showed me where I was supposed to go.